When most people think of stoner food, they typically think of fatty, greasy items like nachos or chili cheese fries. When most people think of food to get you high, the first thought is usually pot brownies. But there is a whole realm of marijuana cuisine that goes beyond the obvious. Enter "The Official High Times Cannabis Cookbook" by Elise McDonough and the editors of High Times magazine. This cookbook might have some familiar favorites, but it also offers interesting riffs on more advanced cannabis cuisine like farmers' market risotto and potato gnocchi with wild mushroom ragu. Mention the word "marijuana" or better yet pull out your stash, and the first thought that springs to most stoner's minds is rolling a joint, packing a pipe, toking a bowl, hitting a bong, or putting a flame to some other smoking accessory. But it wasn't always that way. Ancient people throughout the world have use marijuana as a cooking ingredient -- pot brownies only became popular in the 1950s. The passage of California's Proposition 215 in 1996, effectively legalizing medical marijuana, helped in "opening the door for more and more people to realize the benefits of eating their stash instead of smoking it," McDonough writes. HuffPost Food spoke with McDonough to learn more about the book and the finer points of cannabis cookery. Check out the interview below, and scroll down for some recipes from the book -- including Bar-B-Cannabis Sauce and Cheeto Fried Chicken. Are you seeing an uptick in the consumption of edible marijuana? It's definitely a growing part of the industry. It's very similar to what's going with organic food and farmers' markets. The cost of cannabis is falling in California because so many people are growing it. People are trying to find other way to use it and make a profit. What are the reasons a patient or recreational user might prefer to cook and eat the substance over more traditional forms of ingestion? When you eat the cannabis as opposed to smoking or vaporizing, it lasts longer. if you deal with chronic pain, you are going to get release for four to five hours instead of one to two hours. It is more discreet, and it saves your lungs. Chronic longterm smoking can lead to bronchitis. The staple of French cuisine are the mother sauces (hollandaise, bechamel, etc.) Is there an equivalent in cannabis cuisine? The basic infusion that you are going to have to master is the butter or the oil. The main way you get cannabis into your food is simmering it in a chosen fat. That involves a chemical reaction of a THC molecule binding to the lipid. What's the easiest technique for extracting THC from marijuana -- butter, oil, tinctures or something else? The easiest standard way is with butter because it is easy and potent. If you are a vegan or you don't want that much saturated fat, olive oil and coconut oil works well. Once it is in the butter, you can bake it at a normal temperature. If you cook at a very high temperature, the THC will begin to degrade and it will lose its potency. For butter, keep it on a low simmer -- you definitely wouldn't bring it to boil. One of the best ways to make a good cannabutter is to do it in your Crock Pot. It is important for people to know that raw cannabis, the fresh plant out of the ground, is not psychoactive at all. There is a process called decarboxylation after you dry the plant that makes it psychoactive. What is the key to a good cannabis dish? Don't overdo it. Especially when people are making stuff and they know you are from High Times. I want to be able to eat a satisfying portion of something without it sending me to the moon. Theres also such a wide variety of ingredients to start -- dried buds, trimmed leaves, sifted kief, unpressed hash (the most expensive, but tastiest). If you're looking for flavor, you're going to want to used dried cannabis instead of fresh. Sometimes you can get kind of a unpleasant grassy taste from fresh marijuana. The flavors of marijuana clearly work better with some foods than others -- what are some characteristics of the flavor profile of marijuana and how do you use that to determine good pairings and recipes? There's a group of chemicals found in all plants called terpenes and flavonoids. Different marijuana strains also have these chemicals. Some strains are citrusy and others can taste like pine. With the advent of laboratory testing, people are doing analysis which allows people to experiment. For example, in the book, for the Tom Yum Ganja, chef Ashley Boudreaux found a hay strain that paired very favorably with the ingredients. Are there any foods that don't work with marijuana? I haven't come across things that are unsuccessful, only when there is too much [cannabis] in there. if you do a good infusion, you are going to get a hint of it. It pairs really well with chocolate and peanut butter though. It depends on my mood. I love the cover recipe -- pumpkin pie is one of my favorite things. I like the Ganja Granny's Smoked Mac 'N' Cheese. I also like the lighter stuff like the Rasta Pasta and Reggae Rice and Bean Soup. Do you have any advice for a budding cannabis chef? Low and slow. That goes for both eating and cooking. When you are eating, you want to start with a low dose and go slow. Wait an hour to see how it effects you. Same with cooking. Simmer low and slow. 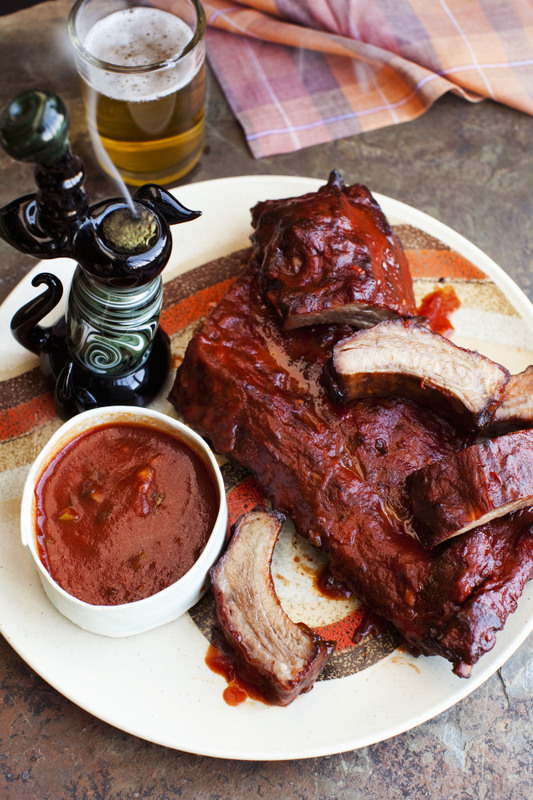 Check out some recipes from the High Times Cannabis Cookbook below. All slideshow text excerpted from the High Times Cannabis Cookbook. Cook Ashley Boudreaux devised this barbecue sauce recipe that's perfect for the Fourth of July. Simply smother any meat, vegetable, or tofu in it, then chow down and wait for the ganja-infused fireworks to follow! Unfortunately, the Land of the Free still imprisons more of its citizens than any other country on earth, including more than eight hundred thousand arrests every year for marijuana. So amid all the talk of liberty this time of year, make a promise to yourself to fight for your rights, and to always remember that until every pot prisoner is released, none of us are ever truly free. Every year around the Fourth of July since 1972, the Rainbow Family holds its annual gathering in a national forest. These gatherings attract tens of thousands to live lightly on the land, and culminate in a morning of silence, during which all participants agree to pray for peace. Everyone assembles in a meadow where an enormous om circle forms. A parade of children arrives and the silence is broken amid a huge amount of hoopla. Everyone celebrates with dancing, smoking, and the sharing of watermelon slices. If you're ever able to attend, make sure to mix up some of this sauce and bring it along! Makes 2 cups 1/3 cup vegetable oil (not olive oil) 10 grams commercial-grade (or 5 grams high-grade) cannabis, finely ground 3 tablespoons chopped green onion Juice of 1 small lime 2 tablespoons apple cider vinegar 2 tablespoons Worcestershire sauce 1 tablespoon soy sauce 3/4 cup tomato paste 1 tablespoon minced garlic 2 tablespoons dark brown sugar 1/2 tablespoon chili powder Pinch of cayenne pepper 1 tablespoon honey 1/8 teaspoon ground ginger 1/2 cup apricot nectar or pineapple or mango juice In a Crock-Pot, combine oil, cannabis, green onion, lime juice, and 1 tablespoon of water and cook at no more than 200°F for at least 90 minutes -- the "keep warm" setting will probably do the trick. Add apple cider vinegar, Worcestershire sauce, soy sauce, tomato paste, garlic, dark brown sugar, chili powder, cayenne pepper, honey, ginger, apricot nectar, and 1/4 cup water. Mix well, and simmer very gently on the medium setting for an additional 35 to 45 minutes while stirring occasionally. Note: Getting a good, solid stone takes no more than 3 to 4 tablespoons per person. Use it for basting, dipping, or as a condiment on burgers and other sandwiches. Refrigerate and it will keep for up to 1 week.